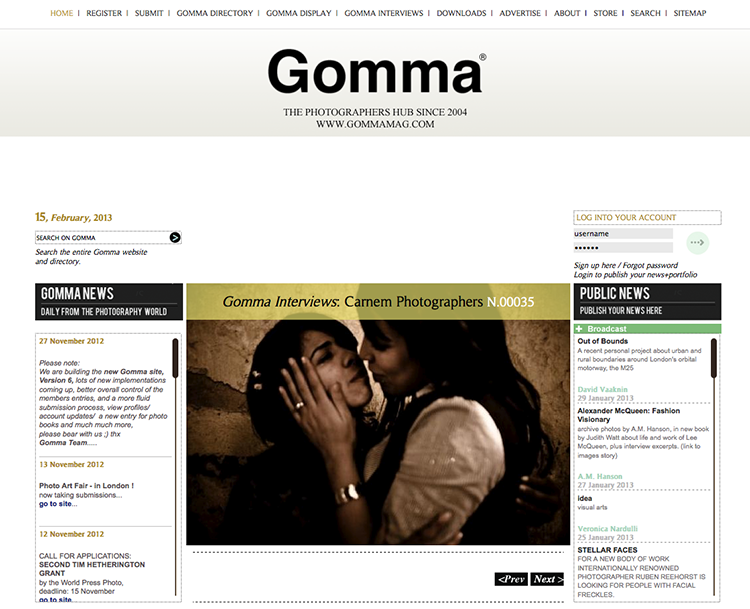 fototazo: Publisher Q&A2: Luca Desienna of Gomma Magazine Ltd. Publisher Q&A2: Luca Desienna of Gomma Magazine Ltd.
Last year we posted a "Publisher Q&A" series, featuring 12 short interviews with a range of publishers including Alec Soth, Shane Lavalette, Bryan Formhals, Jeffrey Ladd, and Jason Fulford on their presses and the state of the publishing market (see the site links page for more links). It was a popular series, and we've decided to add another 12 entries to the series with more extended questions. The first two posts of this second series were with Éanna de Fréine of The Velvet Cell and David Schoerner of Hassla Books. Today we follow with Luca Desienna of Gomma Magazine Ltd.
fototazo: What is the back-story on how Gomma Books formed? Luca Desienna: We founded Gomma Magazine Ltd in 2004 which was not only a printed biannual publication but also a popular online portal, so having stopped the production of the actual magazine we felt we needed to change the name of the company. In addition in 2012 we also decided to publish a few photographic books, MONO being the first title. So this is why we founded Gomma Books. It is meant to be a bijou publishing house that releases a few titles per year. f: Was there a particular need in the industry that you saw and sought to fill? LD: I think it had more to do with our own creative juices than with the industry needs. To be honest I don’t think the industry needs more publishing houses, there are so many nowadays. Which don’t get me wrong it's quiet exciting. f: What are the particular or unique strengths of the books Gomma publishes? What separates it from other publishers? LD: The main core was that of publishing monographs from uncooked talents, being able to bring to the surface unpublished gems. Our first title, MONO, has been however a collection of black and white photographers. This was something we had in our mind for many years so we decided to start with MONO. Publishing emerging talents is very exciting, but also very risky and I'm not sure that with the current market we are in a position of taking such risks. This is why we are looking into the possibility of releasing titles through a Book on Demand system and this why we are currently in touch with Blurb, let's see what this could lead to. LD: We are looking for something new. Daring. Upsetting. LD: Contrary to what most people believe photography books will never be replaced by the digital. It will become harder and harder to get titles printed out and especially distributed. (Shipping and dsitributing is just a pain). It will get more expensive, and new eco laws will play against it etc. etc. But no digital iPads or anything like that will ever be able to get closer to the experience of browsing through a book. As for the market, I don't think anybody can figure out how the market really is now, it is so fragmented and volatile and ever-changing. f: How do you see the book market and products evolving in the near future? LD: Once the Book on Demands printing process and its system acquire more printing quality and flexibility it will revolutionize the way we print and distribute books and this will inevitably open up new horizons and hopefully it will mean more revenues for the actual photographers. f: Lots of people have commented over the past few years that we’re in a photobook Golden Age. Do you think this is true? LD: It has definetely opened up and made lot of new ventures possible, including ours, while in the past it was more a game of the few. The internet has enabled international sales and there are selling tools and companies like Amazon that allow a safe and international distribution. But you also have to face greater competition as the quantity of titles being produced is vast. It is a very exciting age that’s for sure. LD: I think this is very personal. Everyone, both the author and the user, have their own personal taste, likes and dislikes. Personally for me there is no better presentation than a book. It is an intimate process which can be done whenever I want and I can repeat it how many times I feel like. I can do it on my terms and in my place. While an exhibition has restrictions and also distractions. Digital is nice for periodicals, for publications that have a time frame. It also brings some technicality that not all of us are willing to go through. A printed book is there on my shelf. Forever. f: Is a photographer's style, voice, or "sensibility" something equally apparent in their photobooks as in their images? LD: This is the editor's mission. f: What are as the trends in contemporary photobooks that you are noticing as you engage with new book proposals on a daily basis? LD: To be honest, thank God, I can't notice a trend. But I notice the mistakes and the errors that many photographers make, the main being the fact that photographers think that they still need to go abroad in far away and risky and troubled situations in order to find stories. When stories are all around us. ...and getting in touch with great personalities like Roger Ballen, Anders Petersen, Trent Parke...sublime minds. f: What are your next steps for Gomma? LD: We are days away from launching the new Gomma website, Version 6, which we have been developing for the last 12 months. Also we are planning to re-launch Gomma Magazine for the iPad, and soon we will start selecting from all the photographers that submitted to our second book project, Su-ture. We are in talks with Blurb for launching a series of hardcover books. So lots of projects. But all these will take time...we are a small company and having time for ourselves is also an important part of our philosophy.